There's a lovely sense of quiet serenity here now that the kids are back at school. The only sound being the dog snoring as he dozes at my feet. Now, cup of tea by my side, I can finally catch up on all my work emails and get some planning for the year done; workshops, photoshoots, farming, hosting a German exchange student, turning 50. 2018 is going to be a big one. Between preserving, school runs and settling in my temporary German son, I've also been doing lots of recipe testing, ordering produce and working hard in the garden to make sure things are looking as spick as span (well as I can get them) for our workshop in March. I'm so thrilled that our preserving workshop has sold out and there's just two spots left for the Italian inspired cooking class and lunch. Whoop! 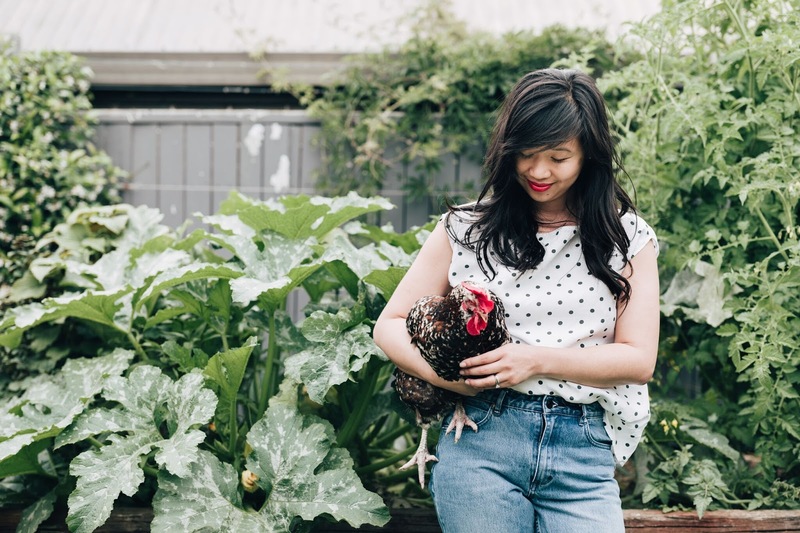 So in the meantime, I thought you might like to get to know Vanessa @thehungrychook Miles who is hosting the workshop with me. I'm so thrilled that she is coming to share her knowledge and skills with us in our little corner of the world. I'm also delighted that Vanessa has persuaded Flore Vallery-Radot to join us. Flore known as @thefloshow is an accomplished cook and photographer amongst many other skills, and she'll be joining us to film the two workshops. Flore also took this gorgeous image of Vanessa. Have you always enjoyed cooking and eating? Yes! My father is a wonderful cook and we always ate well when I was growing up. I have fond memories of making fresh pasta (and the fun of hanging it over broomsticks balanced over the backs of chairs), when I was very small. I also remember mornings staying at my grandparents’ house when my grandfather would wake up with the sparrows and go out in his boat. Hours later, he would return smelling of the sea as he cleaned garfish on the back porch, which my nanna would then cook us for lunch. Why is growing your own food and keeping chickens important to you? Growing up, there was an enormous apricot tree near the worm farm in my grandparents’ backyard. My sister and I waited all year for late-summer when my grandfather would climb up an old, wooden ladder and pass us apricots which we would eat, still-warm from the sun. I can still taste the tiny beans my nanna would let us pick and eat raw from the bushes she grew in rows -- these are taste-memories that wouldn’t be possible had the apricots or beans come from the nearest supermarket chain. Today, we have only a small backyard, but growing what we can and keeping chickens is a privilege that reminds us to eat seasonally, reduce waste as much as possible, and to eat less meat (and meat that is ethically sourced). Cooking for others is about nurturing and nourishing the people I love, it’s something I do to relax and I’m very passionate about it. Teaching is an extension of this – an opportunity to share not only recipes and helpful hints, but also stories from my travels in a relaxed and fun setting. You spend a lot of time in Rome, what do love about it? For me, Rome is not just Italy’s capital, and the most populated comune in the geographical centre of that boot-shaped country: it is the place where for centuries food has been the centre of social life. I have been lucky enough to visit Rome four times over the past five years and slowly, as I have discovered the best places to eat ‘carciofi’, to buy Pecorino Romano, and to navigate its streets without a map; I have fallen in love with it more and more. Nowhere is the concept of eating seasonally more tangible. Thank you Vanessa, it's been lovely to chat! There is NO WAY you are turning 50!!! You’re preparing for someone else to turn 50 right?! Ha! Ha! I certainly am! I'm very excited! Not til August, but 50 is seems much more meaningful than 49. So I figure I'm going to start being 50 now and celebrate for at least 18 months! Holy moly!! No way! Sista you are too young to be 50....great gene's! !